Florida resident Jason Colon was listening to his AirPods while at the gym this week when they started to malfunction, and a white smoke allegedly started pouring out. 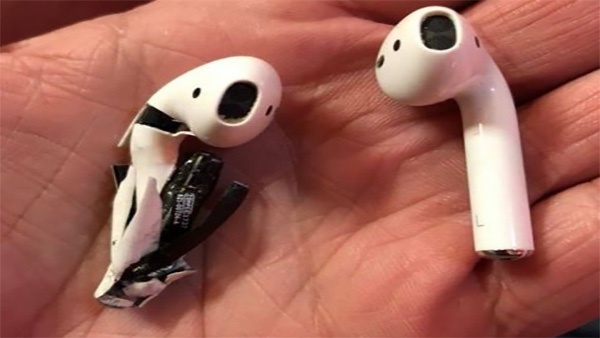 According to Colon, he then left the AirPods sitting on a piece of gym equipment and ran to get help, and when he got back, one of the AirPods was charred and destroyed. "It was already like this. It was already popped. I didn't see it happen, but I mean, it was already fried! You can see flame damage," Colon told a local channel 8 news station. It appears no one else at the gym was around to see what happened to the AirPod, so it's not clear if the device did spontaneously explode. There have been no prior reports of issues with AirPods, but it is not uncommon for iPhones and other devices to see one off battery issues that can result in fire. According to an Apple spokesperson, Apple is investigating the incident and will be reaching out to Colon to figure out what happened. That must have been earitating. That's just plain earresponsible. He was playing my mixtape. It’s Florida (my future home). I didn’t need to read any more. I mean sinkholes, tropical storms, palmettos . . .
What in the sweet Lord’s name is the purpose for that terrifying man-sized bottom-feeding grub bug. It’s like something off Starship Troopers, except less endearing and more revolting. I would have been perfectly happy spending the rest of my days not knowing that existed. This is the result of listening to Coldplay. What people will do to make a buck...any evidence of fire will be on the piece of equipment. Actually me being the person to, I am not looking for compensation. I’m Blessed to not have suffered any injuries, but thanks for your concern! Actually me being the person it happened to, I am not looking for compensation. I’m Blessed to not have suffered any injuries, but thanks for your concern! Oh and there is melted plastic and charred burns if your interested, Apple has it and replaced it for me. Thanks. My first thought just seeing the picture was that a dog had chewed it, it looked crushed, not burnt/exploded from inside. With regards to the water resistance, I’ve accidentally put mine through the washing machine for 10 minutes and they still work fine to this day. Anecdotal sure, but it’s my experience. ya there was no dog at la fitness, the smoke came out of it, and they work fine if exposed to water so sweat wasn’t the issue herex Apple has them so curious to see what they find. Those don’t look like legit AirPods. The proportions are way off. I looks more like a weight was dropped on them than they caught fire. Provided that pic is of the actual incident, where is the residue from the smoke? Just looks a bit off. They are actually the only company I know that do care. This guy could have very well made it up. Of course, it makes sense that no one was around to see it. Not even a mobile phone camera to film it. I can imagine this guy wanting his story to go viral on the internet. And probably ask for a few millions compensation for the mental damage and all sorts of other troubles he had to go through with this horrific incident. Actually no, I want no compensation. Maybe if they happened to you, you would. Like I said, I am not hurt. I’m fine and Apple replaced them. Case closed. People want there to be drama. And it wasn’t horrific. Common sense said get an employee and keep it out of my ear. A stupid person would have put it back in and let it explode then want compensation. Another good reason NOT to remove the headphone jack. Slightly dubious (and not at all an Apple-apologist). Looking at the plastic housing it looks to have been crushed, the plastic is broken into nice pieces, not all melted and scorched. Maybe they were crushed which then damaged the lithium battery? The first report of fire and also the first one after being released for more than a year? I’ll file this under manufacturing defect.